Adds 115+ sound effects to the game\'s dungeons that are played depending on the dungeons\' inhabitants. If you wish to use the sounds found in Sounds of Skyrim that are credited, you must credit those authors and provide a link to the original sound file in your Credits section, like I have done in mine. If you re-upload or update this Sounds of Skyrim module, you need my permission to receive Donation Points. The Community for suggesting additional sound effects and excellent ideas. Change: The configuration script’s initiation has been changed to support the Live Another Life mod. Bug Fixes: Cleaned dirty edits that escaped me before; including one that would create a tiny conflict with the two other SoS modules. Change: Changed the configuration script to launch only if the player has completed the tutorial quest (Unbound) and escaped Helgen. Change: Three thunder sound effects have been reworked. Additions: Added an in-game config menu to replace the volume sliders which, unfortunately, didn’t work as intended. Changes: Removed the volume sliders. Cleaned the ESP to prevent crashes or save game corruption. Addition: Added chain shackles sound effects in forts. Addition: Added a boiling sound effect on most cooking pots in dungeons. Addition: Added volume sliders in the game's audio settings where you can configure the output of each sound category. Addition: Restored the cold wind sound effect played at cave entrances and near windows during a snowstorm. Changes: All sounds' default volume output has been raised for better customization with the new volume sliders. The Dungeons: Added a potion boiling sound effect to alchemy stations in dungeons inhabited by humanoid NPCs. The Dungeons: Removed rats and bats from undead-inhabited dungeons. The Dungeons: Reduced the frequency at which sound effects are played by a small margin. The Dungeons: Reduced volume of most sound effects by a small margin. The Dungeons: Looped cold wind sounds playing at dungeon entrances now only play when there’s a snowstorm outside. The Dungeons: Reduced the hearing range of rain hitting windows/wood and cold wind. The Dungeons: Removed SoCSnowStormWind02lp sound effect. The Dungeons: Edited several parts of the readme. Quick note: Sounds of Skyrim - Civilization is now bloat-free! The infamous bug has been fixed for good. Whew! You can download it here. - Compatibility patches for several mods are now available. Look in the Technical section for information. 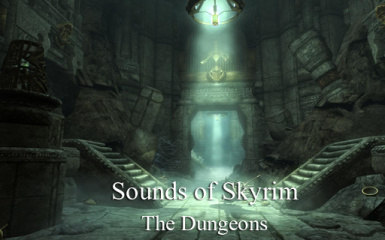 There's a standard sound set for each type of dungeon: Cave, Dwemer Ruins, Forts and Sewers. These sounds play in these dungeons regardless of who or what lives in it. To spice it up, dungeons inhabited by Falmer or the Undead have their own sound sets in addition to the standard ones. Undead dungeons have zombies and wraiths screaming or moaning. In Falmer dungeons, you'll hear their occasional screams; a way of communicating with each other since they are nearly blind. What is Sounds of Skyrim? Sounds of Skyrim is an audio project split in three parts that, in the end, adds around 460+ sound effects to the game world. It affects almost every cell and region in the game. My main goal is to not have one environment that is soundless to enhance immersion. The sounds are affected by the time of day, weather and location. So when walking in the city streets during the day, you'll hear the echo of doors opening and closing, children playing and workers sawing things. While at night, cats fight for territory and dogs bark. All three modules have been released and can be obtained on the website from where you downloaded this module. The Wilds focuses on adding sound effects in Skyrim's wilderness. With the 115 new sound effects, the purpose of The Wilds is to audibly enlarge Skyrim's fauna with the addition of various animals, birds and insects that play according to weather, time of day and region. In the forests, for example, you'll hear the sounds of foxes, deers and ravens. At night, you'll hear wolves howling from far away or common loons calling others. In The Reach, you might hear the occasional mountain goat or hawk. In addition to animals, The Wilds also adds rain-impact sounds on tents and wooden structures, sounds of rustling bushes to simulate the movements of small mammals that scatter away as you approach and sounds of calm water waves hitting wood on tree logs or structures that are partially submerged in water. Civilization focuses on adding 223 new sound effects to cities, villages, farms and remote locations where civilization is present. In cities, you can hear the sound of a hammer being used by a villager repairing something, children playing, dogs barking or cats fighting. As you get closer to a tavern doorstep, the sounds of patron chatting from behind the door are played. When you get in, some patron may laugh out loud, yell or break something. On farms or near them, you can hear the sounds of their animals, if they have any. Most of those sound effects can be heard inside buildings too, linking the interior cells with the exterior. If I take the farm example, you may hear the hen if you sit close to the window. If it’s raining, you’ll hear the rain hitting the windows; if there’s a snowstorm, you’ll hear the cold wind whistling by the windows. I invite you to view and hear the video trailer that shows Civilization in action to get a better glimpse of what the sound additions are. Note that the sounds heard in the video are played more frequently and at a higher volume on purpose to show you the variety of sound effects and to easily distinguish them from the vanilla sounds. Note also that some sound effects have changed since then. Finally, this mod would never have been possible without the contribution of many sound recorders and artists from Freesound.org. There's a file in the archive with the credits for everyone who made the sounds. A HUGE thanks to them, otherwise the sounds would not have been as high quality as they are. You can also view the credits in the Credits tab above. 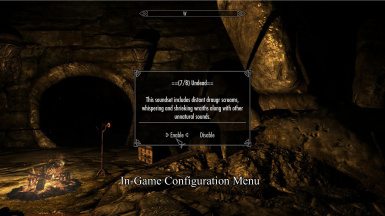 Some mods require a compatibility patch to work with Sounds of Skyrim – The Dungeons. You can find the patches on the mod’s download page. If you encounter a mod conflict that is not listed here, please let me know in the Forums tab. The following is a list of mods known to be compatible or incompatible. Q: "The sounds in the videos are too loud or/and the delay between them is too short." A: This was done in purpose in the videos. The higher volumes allows you to distinguish them from the default sounds and the frequency allows you to hear as many sounds as possible to give a nice preview of what the mod does. In the game, the volume is much lower and the sounds do not play frequently. Q: "I do not like "that" or "this" sound. What can I do?" A: You have two options available to remove a sound or a group of sounds. First, there is a silent sound file in the mod's sound folder that you can use to replace the sound effects you do not wish to hear. Q: "Is it possible to have creature-related sounds stop playing once a dungeon is cleared?" A: No. There is a function that allows me to check if a dungeon is cleared, but it refers to the first time you clear it only (Once the game sets "Cleared" on your map). Doing so would make the creature-related sounds stop playing once you clear the dungeon for the first time and they wouldn't play once the dungeon resets. Q: "Does Sounds of Skyrim decreases performance?" A: No. The way the new sounds play is the same way the game's default sounds are played.